If wildfowl and wild birds make your shutter finger twitch, but you’d like to sharpen your shooting skills, then why not try one of the 15 courses on offer at Slimbridge in 2019? The Wildfowl & Wetlands Trust Slimbridge reserve is located on the Severn Estuary in Gloucestershire and is well known for its ducks, swans, geese, flamingos and cranes, plus avocet, lapwing, kingfisher, curlew and bittern. Slimbridge is also home to otters, toads, mice, dragonflies and roe deer. Digital Camera magazine recently spent a day at the reserve photographing birds for the January issue’s wildlife feature, which goes on sale in the UK from 14 December. To make sure of your copy every month, subscribe at our online shop from just £12.50 for three months! With 13 hides, a tower and an observatory, there is no shortage of vantage points at Slimbridge, making it a one-stop solution for appreciating our feathered friends. And there's a gift shop, restaurant and refreshment kiosks for recharging your batteries – both figuratively and literally – in between wildlife-spotting sessions. 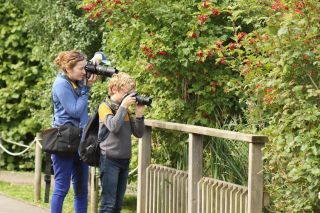 The courses cater for beginners up to enthusiast photographers, and most of them take place between 10am and 4pm. The course fee includes tea and coffee. Here's what's available: Wildlife Photography for Beginners (choice of three dates; £63 per person), Winter Wildlife Photography (16 February; £63 per person) and Family Wildlife Photography (choice of four dates; £32 per adult and child). Spring Wildlife Photography (26 April; £63 per person), Nature Photography in a 4x4 vehicle (choice of four dates; £62 per person) and Autumn Wildlife Photography (18 October; £63 per person) are also on offer. For more information, visit the WWT Slimbridge website.